Construction has begun in an 8,400 square foot portion of Building 320 at Eastman Business Park, where a battery and energy storage company that was founded in Ithaca, NY established corporate headquarters and manufacturing operations in August 2013. 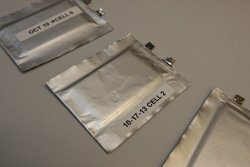 From its new facility, NOHMs Technologies plans to commercialize next generation lithium-sulfur batteries featuring advanced chemistries for cell phones, portable radios and motor vehicles ranging from spacecraft to electric cars. (NOHMs stands for Nano Organic Hybrid Materials). The NY-BEST commercialization center was a key reason why NOHMs chose Eastman Business Park for its research and manufacturing operations. The commercialization center is where companies and universities can go to create prototypes for new energy storage and delivery systems, test them, do pilot manufacturing and then get business assistance to take those products to market. 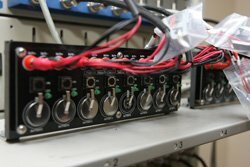 “This is equipment NOHMs doesn’t have to buy, that we can leverage and use on an as-needed basis and save a tremendous amount of money on the road to commercialization,” Ball said. There is another reason why Eastman Business Park stood out over locations in Michigan, Georgia and Texas. “The availability of a highly skilled and talented workforce in Rochester played very heavily into our decision,” said Ball, who founded NOHMs in 2010 following research into the use of nanoparticles in lithium batteries that can deliver three times the energy density at a third of the cost.